This concept is particular apt when describing today’s Irish technology-enhanced learning community as it grapples with: increasing demands with limited resources; new models of teaching, learning, assessment and accreditation; emerging strategies, policies and frameworks; and where traditional concepts of the professional, professionalism, and professional life are being reconstituted in an increasingly digital age. Barnett contends that it is impossible for individuals to resolve this overwhelming agenda in traditional terms. Barnett contends there are four ‘epochs’ of learning. He states that initially learning was a matter of departing from this world and moving into a different world. This learning is metaphysical, giving access to a meta-reality. Drawing on Plato’s imagery he states that a learner is able to escape the cave of illusions and see the world anew. Learning is seen as efficacious in epoch 2. Through learning an individual is able to put themselves in a better position in the world. In this epoch, there is a real and definite world and learning enables one to know it better. In addition to knowing more about the world, an individual is able to do things they weren’t able to do before. However, the world is changing and in part as a result of the changes in the world made possible by epoch 2 learning. Importantly, what we learn today won’t necessarily equip us to live effectively in the world tomorrow. Consequently learning becomes a matter of moving with the times. There are no fixed or universal rules for learning. Learning is in situ, and takes place in discrete contexts. This ‘learning on the hoof in an unstable world’ constitutes epoch 3 learning. It is learning brought about as a result of learning about learning. Epoch 4 learning is a result of realizing that not only is the world changing but it holds with it proliferating and competing frameworks by which we understand the world. This is, he argues, a supercomplex world, a world characterised by confusion as to what is to count as learning. What counts as learning for one group may not be the same for another group. We live among proliferating and incompatible frameworks, each of which at best can yield only a partial insight into our world. … It is not just a matter of coping with uncertainty, for that formulation is overly passive and reactive. An age of supercomplexity requires the will to go on in a milieu in which there is no security and calls for the courage to make purposive interventions even in the understanding of that lack of security. … The humanities have been in the business of spawning frameworks anew for our self-understanding. Their insights, their concepts, their methodologies are inherently reflexive: … these reflexive properties furnish us with a new wherewithal to be, to act and to communicate … In short, the humanities can assist our accommodation to a world of supercomplexity by promoting forms of being appropriate to supercomplexity. A new and wider educational project awaits them, if only they would seize it. (Barnett 2001, 36–7). The following are some of the key aspects of the concept of supercomplexity and its implications. We are preparing students for an unknown, uncertain changing future, to do jobs that don’t even exist yet. Therefore we need to move beyond knowledge recall to teaching them the competencies and skills they need to be lifelong learners, to be flexible, agile and adaptable, to harness the power of digital technologies and their social networks to support their continued learning. We are living in a word in which we are conceptually challenged. The way in which we understand our interactions in digital spaces has changed and become more complex. The boundaries between real and virtual have blurred. We have fragmented identities across real and virtual spaces, different people ‘see’ us through different channels: twitter, facebook, linkedin, email, blogs, webinars, etc…. We need new concepts and metaphors to understand how we perceive and behave in these digital spaces, concepts and metaphors beyond the idea of place and time, and more associated with the notion of networks and interactivity. Digital technologies offer a plethora of ways in which we can interact with content, and ways to communicate and collaborate. This leads to complex interactions online and exacerbates the concept of supercomplexity. Furthermore technologies are constantly changing and the ways individuals interact with and use them changes over time. Learners are increasingly using smart phones and mobile devices to support their learning, meaning that learning anywhere and anytime is now a reality. However this means that institutions need to redesign physical spaces to be technology enhanced. The Spaces for Knowledge Generation project did a worldwide study tour of innovative learning spaces and identified seven principles of designing digitally enhanced learning spaces: aesthetics, affordances, blending, comfort, equity, flow, and repurposing. Rhizomatic learning is a way of thinking about learning based on ideas described by Gilles Deleuze and Felix Guattari in a thousand plateaus. A rhizome, sometimes called a creeping rootstalk, is a stem of a plant that sends out roots and shoots as it spreads. It is an image used by D&G to describe the way that ideas are multiple, interconnected and self-replicating. A rhizome has no beginning or end… like the learning process. We are operating in a constantly changing techno-ecosystem with which we interact and co-evolve. Pea described a series of phases of technology interaction. The first phase being essentially ‘cultural mediated’ (face to face), the second being ‘symbol mediated’ (letters and numbers), the third being ‘communication mediated’ (TV, radio phone), the fourth being ‘network mediated’ (wireless database internets) and the fifth being ‘cyber infrastructure mediated’ (cloud computing, intelligence of crowds, constant contact, sensors networks). All “action possibilities” latent in the environment, objectively measurable and independent of the individual’s ability to recognize them, but always in relation to the actor and therefore dependent on their capabilities (Gibson, 1977, pg. 67-82). The affordances of the environment are what it offers the animal, what it provides or furnishes, either for good or ill (Gibson, 1979, p. 127). Conole and Dyke (2004) propose the following types of ICT affordances: accessibility, speed of change, diversity, communication and collaboration, reflection, multi-model and non-linear, risk, fragility and uncertainty, immediacy, monopolisation and surveillance. They argue that the taxonomy has a number of uses. Firstly, that establishing a clearer understanding of the affordances should help to inform practitioners in their use of technologies to achieve particular goals. Secondly, that it can also help to identify potential limitations and inappropriate uses of the technologies. Thirdly, by making the inherent affordances of technologies explicit, the taxonomy can act as a discussion point for critique and further refinement. Fourthly, it can be used as a checklist to help practitioners understand the advantages and disadvantages of different technologies. Fifthly, it can be used as a mechanism for staff development and improving practice – for example, by providing a checklist of potential benefits and drawbacks of different technologies, which can be used to inform choice and the ways that practitioners might choose to use them. Another useful concept with respect to our interactions with technologies is Salomon’s concept of distributed cognition (Salomon, 1993). it emphasizes the ways that cognition is off-loaded into the environment through social and technological means. Salomon developed the concept before the emergence of the web but it is particularly insightful in today’s technological world, where our cognition and identity is distributed across a range of interfaces. How we interact through digital technologies gives rise to our digital identity and how we are perceived by others. 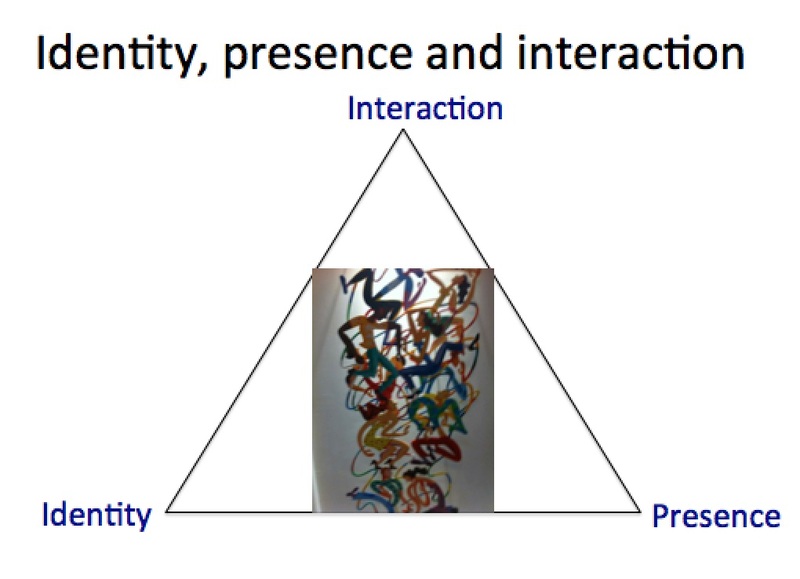 The figure below shows the relationship between identity, presence and interaction. Our identity builds on our beliefs and our approach to the world, this influences how we interact which in turn relates to our presence. Interacting in today’s technological landscape is not simple and requries a particular set of digital literacies. The term digital literacy is contested and has evolved over time. Gilster (1997) introduced the concept as ‘the ability to understand and use information in multiple formats from a wide range of sources when it is presented via computers’. He identified four key competencies: (a) assembling knowledge, (b) evaluating information, (c) searching, and (d) navigating in non- linear modes. Martin (2006) extends Gilster’s definition as follows: digital literacies are “the awareness attitude and ability of individuals to appropriately use digital tools and facilities to identify, access, manage, integrate, evaluate, analyse and synthesise digital resources, construct new knowledge create media expressions and communicate with others, in the context of specific life situations, in order to enable constructive social action and to reflect on this process”. Digital literacies can be used to bring together knowledge, attitudes and skills, and so encompasses the basic ability to use digital devices and applications as well as allowing for the development of a level of critical, reflective and strategic capability in various areas of application and practice. Jenkins (2009) lists the following digital literacies, which he argues are needed to be part of what he calls today’s participatory environment: play, performance, simulation, appropriateion, multi-tasking, distributed cognition, collective intelligence, judgment, transmedia navigation, networking, negotiation and visualisation. Returning to Barnett’s notion of supercomplexity, it is not just that our interactions in today’s technical landscape are complex, dynamic and changing, but we live in a complex and changing world. There is the increasing impact of globalisation, an increasingly sinister political climate, the impact of cultural issues and religious beliefs on actions, and the unknown impact of climate change. In particular within this context, universities are subjected to a number of demands: accountability, massification, internationalization, quality assurance, etc. Universities are now operating in a climate of increased competition from other players, such as publishing houses like Pearsons and free Massive Open Online Courses (MOOCs). A number of other concepts are related to Barnett’s notion of supercomplexity. Giddens (1999) and Castells (2000) describe the networked and globalized nature of modern society and the impact of the changing nature of societal values (including the defragmentation of the family unit, polarized perspectives on secular versus religious beliefs, and the changing roles of individuals and organisatiions. Beck’s notion of the risk society is concerned with how a society deals with risk and arguably given the above we live in a world with an increasing number of risks (Beck, 1992). He defines it as defines it as ‘a systematic way of dealing with hazards and insecurities induced and introduced by modernisation itself’. The implications of these new technologies for learning and teaching are profound. Unintended consequences (Beck, 1992) of use will arise, misuse and abuses of the system will happen, the digital divide is still present; those not engaging with technologies are getting left further and further behind ((Warschauer, 2004). Warschauer critiques the relationship between access to information and communication technologies and social inclusion. He argues that: “the ability to access, adapt and create new knowledge using new information and communication technologies is critical to social inclusion in today’s era” (Warschauer, 2004, pg. 9). I believe there is no deep difference between what can be achieved by a biological brain and what can be achieved by a computer. It therefore follows that computers can, in theory, emulate human intelligence — and exceed it. Bauman (2000) describes liquid modernity as a characteristic of today’s highly developed global society. He argued that its characteristics are about the individual, namely increasing feelings of uncertainty and the privatization of ambivalence. It is a kind of chaotic state where an individual can move from one social state to another in a fluid manner. Giddens (1991) states that: social practices are constantly examined and reformed in the light of incoming information about those very practices, thus constitutively altering their character’. Stehr (2001) argues that knowledge is now central to the modern economy and its productive processes. It is also essential for social relations, social cohesion and conflict resolution. We have moved from a society based around heavy commodities to symbolic goods, from situated markets to non-place-specific locations, from machines to software and from things to ideas. These changes produce new forms of social interaction and new perspectives on identity, practice and association. Furthermore, we increasingly arrange and produce the reality within which we exist on the basis of our knowledge. Barnett (2000) argues that the university has lost its way and that the world needs the university more than ever. He contends that we need to find a new vocabulary and senses of purpose. The university is faced with supercomplexity, in which our very frames of understanding, action and self-identity are all continually challenged. 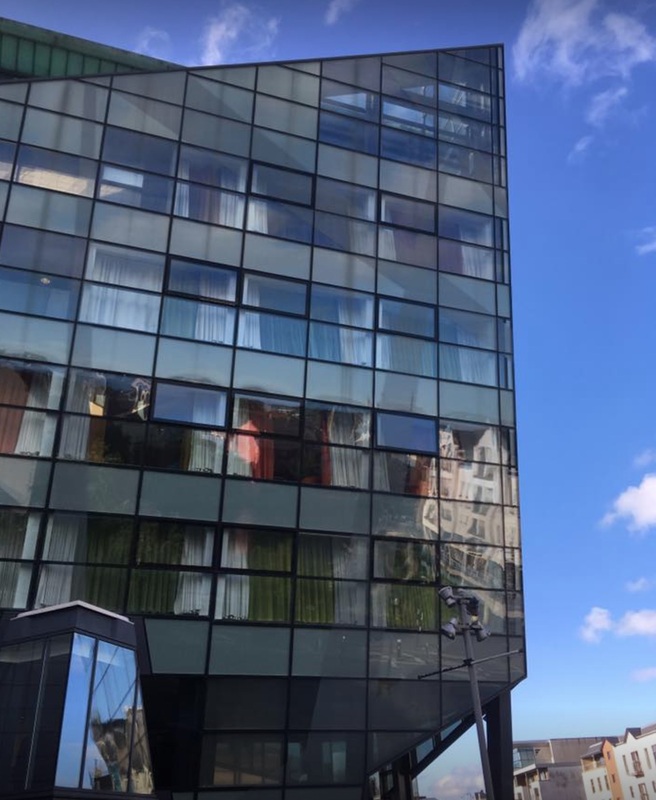 In such a world, the university has explicitly to take on a dual role: firstly, of compounding supercomplexity, so making the world ever more challenging; and secondly, of enabling us to live effectively in this chaotic world. Internally, too, the university has to become a new kind of organization, adept at fulfilling this dual role. The university has to live by the uncertainty principle: it has to generate uncertainty, to help us live with uncertainty, and even to revel in our uncertainty. Barnett, R. (2000), Realizing the university in an age of supercomplexity, Society for Research into Higher Education and Open University Press. Barnett, R. (2001), Crises of the humanities: Challenges and opportunities. In Fuzzy boundaries? Reflections on modern languages and the humanities, ed. R.di Napoli, L. Polezzi, and A. King, 148–73. London: CILT. Barnett, R. (2014), The university in an age of supercomplexity: challenges and possibilities, Guest lecture, UNESP, Sao Paulo State University, available online. Bauman, Z. (2000), Liquid modernity, Cambridge: Polity. Becks, U. (1992) Risk society: towards a new modernity, London: Sage. Castells, M. (2000, The rise of the networked society in the information age: economy, society, and culture, (2nd Ed, Vol 1), Camrbidge, M.A. : Wiley-Blackwell. Conole, G. and Dyke, M., (2004a). What are the inherent affordances of Information and Communication Technologies?, ALT-J, 12.2, 113-124. Gibson, J.J. (1977). The Theory of Affordances. In Perceiving, Acting, and Knowing, R. Shaw and J. Bransford (Eds), pg. 67-82, Hillsdale, NJ: Lawrence Erlbaum. Gibson, J. J. (1979). The ecological approach to visual perception. Hillsdale, New Jersey: Lawrence Erlbaum Associated. Giddens, A. 1991. The Consequences of Modernity. Stanford University Press. Giddens, A. (1999), Runaway world: how globalisation is reshaping our lives: London: Profile. Gilster, P. (1997), Digital literacy, Canada: John Wiley and Sons. Digital Literacies for Learning (pp. 3-25). London: Facet Publications. Salomon, G. (Ed.). (1993). Distributed cognitions - pyschological and educational considerations. Cambridge: Cambridge University Press. Stehr, N. (2001), The fragility of modern societies, Knowledge and risk in the information age, London: Sage. Virilio, P., (1998), The information bomb, London: Verso. Warschauer, M. (2004). Technology and social inclusion: Rethinking the digital divide. Cambridge, 540 MA: MIT Press. You are currently browsing the e4innovation weblog archives for May, 2017.